I'm not sure if this is the right era I'm looking for, but it will have to do. This dress was hand made, but it has some echoes of Butterick B5281. 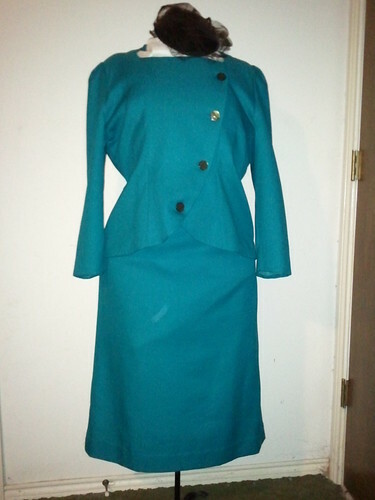 This suit was probably made in the 1970's, based on the fabric and the zipper. But it's my size, and it should pair well with a black hat and shoes, which means I don't have to buy more stuff to make this outfit work. Interested in seeing more vintage stuff? Let me know in the comments.